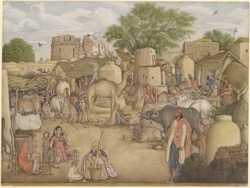 Watercolour of a street scene in the village of Raniya in the Hissar district, Haryana, by an anonymous artist working in the Delhi style, part of the Fraser Collection, c. 1816-1820. In the foreground a young woman sits spinning with a child beside her and other women around her. In the background between the houses and giant jars are cattle, camels and numerous other figures going about their business.